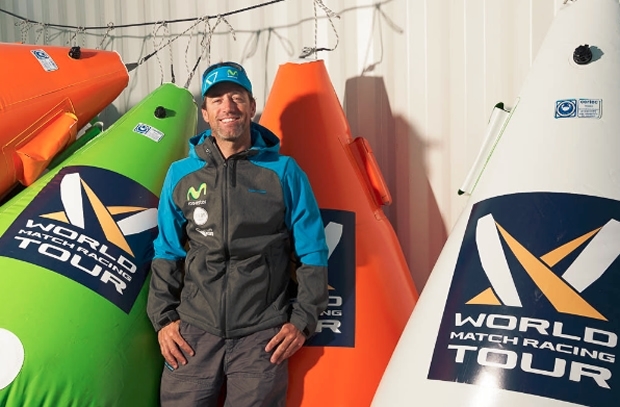 There isn’t much Iker Martinez hasn’t done in the sailing world, but this week will be the first time the Spanish sailing star competes on the World Match Racing Tour when he lines up against 19 other hot international teams in Copenhagen. The 38-year-old Spaniard is best known for his exploits in the 49er skiff class, winning the World Championship three times and taking gold and silver medals at the 2004 and 2008 Olympic Games. He is also a three-time skipper in the Volvo Ocean Race and runner-up in the two-handed Barcelona World Race with his long-time friend and 49er team mate Xabi Fernandez. Fernandez had his first taste of racing the M32 catamarans at the first event of the season, the World Match Racing Tour Fremantle in Western Australia, when he was crewing for experienced Kiwi match racer Phil Robertson. But this week’s six-day Tour event in Copenhagen reunites Fernandez with his long-time sailing partner, with Martinez taking the helm of the M32 catamaran for the first time. While he has spent most of his career competing in monohulls, Martinez has spent the past three years campaigning in the Olympic catamaran class, the Nacra 17, although injury at the World Championships in Florida at the beginning of the year put paid to his hopes of representing Spain for the fourth time at the Olympic Games. Now Martinez will draw on all that Nacra experience as he focuses on adapting himself to the demands of the M32 in the fiercest match racing environment in world sailing. Another Wild Card that Martinez will be familiar with is Michael Hestbaek, a former European Champion in the 49er class and who has represented Denmark in three different Olympic classes: the 49er, the Laser and the Star. He is also a former Danish Match Racing Champion, so he knows his way round the game, and around these particular waters on Copenhagen’s waterfront. Hestbaek is hoping that, like other skiff sailors have already proven, he is able to draw on his 49er experience to quickly get him up to speed with the technique of sailing the M32 fast and confidently. Another Wild Card, Johnie Berntsson is no stranger to the Tour and has recently bought his own M32 for training and competing in the M32 Series. Unlike his fellow Swede Bjorn Hansen, Berntsson will take the valuable experience of competing in the M32 Series event in Copenhagen last week, while Hansen is jumping in at the deep end. Now in his late 40s, Hansen’s match racing experience is deeper than anyone’s, having competed on the Tour almost since it began. And his multihull knowledge runs deeper than most might expect of someone who is best known for his keelboat racing exploits. Hansen took part in six editions of the Archipelago Raid, a tough, two-week long distance adventure through Sweden’s archipelago on 18ft catamarans, and also some sailing on an ORMA 60 trimaran for part of the season in 2000. Hansen and the other 19 teams start the battle in Copenhagen on Monday 9 May with fleet racing qualifying before moving into the knock-out match racing stages, culminating in the Final next Sunday 15 May. Summer has arrived early in Denmark’s beautiful capital, and the crowds will be out in force to cheer home the champion of Denmark, whoever that may be.